The first I can remember about “The Haunted House Behind Linwood School” was from Faye Cain. She passed on the story to me. I had no memory of the house, I am sure it was gone before my exploits as a boy began. Faye new that I loved history and that one day I might come across some data that would open some doors on the subject. After hearing about it from Faye, I heard about it from a lot of other people. Many people had wanted to know about the house. So when I learned the real history of the house I wanted to pass it along. My real chance to do lot of research only came after I went to work for the City of Columbus, Georgia in 2004. As a Property Maintenance Inspector in the Inspections and Code Department one of my responsibilities was to investigate and condemn derelict properties and buildings. This fit my passion for the history of Columbus. I taught myself to do property searches for owner ship and historic value. This sometimes involved going to the deed room on the second floor of the Columbus Consolidated Government Court House. There I came across the deed books that went back to 1836. The court house had burned in 1836 and the earlier deed books were destroyed in the fire. When I went on city business and had time I would also do my own research. There are some land records in the books that include land plats you may not find anywhere else. There is a treasure trove of information in these books. I also took trips to the archives at Simon Schwob Memorial Library on the campus of Columbus State University, another treasure trove of information. My life had been touched by the family that built the house behind Linwood School even though I did not know it at the time. My aunt, Kathryne McPeters Thornton, and her husband, Melvin, would take the kids in my family swimming at Nuckolls Crossing in Russell County Alabama. I knew nothing except the place name. Nathaniel Nuckolls had came to Georgia in the 1820’s. First to Elbert County, Georgia by 1826. Then to the gold fields near what would become Dahlonega, Georgia. He built a Tavern and Inn there. He had slaves that had been taught the construction and carpentry trade. Everywhere he went he constructed buildings. The settlement where he built his Inn was called by the inhabitants, Nuckolls Ville, latter it was named Aurora. The Nuckolls family moved to Columbus by 1836. Nuckolls purchased parts of two city blocks in Columbus. The mansion that Nuckolls workman built though was on land between the 1100 and 1200 block of 15th St. This land was on The Coweta Falls Reserve Lot 41. It may not have been built till after 1848 and was sold in 1870. Possibly the main reason the Nuckolls moved to this area was the land in Alabama. When the Creek Indians had signed the Treaty of Cusseta in 1832 it would open the lands west of the Chattahoochee to the whites. Nathaniel Nuckolls purchased land in Russell County Alabama between 1837 and 1848 totaling 1,762 and 57/100 acres. This would be called Nuckolls Crossing. On the land in Russell County, Alabama on Uchee Creek, Nathaniel Nuckolls workman built a dam and structure for a variety works as well as a family home. The structure on the creek housed a saw mill and other machinery to manufacture many kinds of wooden implements. During the “War of Northern Aggression” one of the products made at his variety works was canteens for the Confederate Army. Nathaniel Nuckolls acquired a patent from the Confederate Government for his canteen design. There is one of these canteens at the Columbus Museum. Do not confuse his variety works with “The Variety Works” on the Chattahoochee River at Columbus owned by William Brooks and others and not built till 1847-48. In the same area in Russell County, Alabama as the Nuckolls, in 1845, Forbes Bradley and Edmond Bradley purchased 160 and 54/100 acres of land. So the Bradleys were neighbors to the Nuckolls. In 1869 Thomas “Tom” Jeremiah Nuckolls (May 6, 1829-1889) married Alice Bradley (1847-1931). In 1869 James Thornton Nuckolls (1843-1910) married Emma Jem Bradley (1846-1924). These were daughters of Forbes Bradley, older sisters of William Clark Bradley (1863-1947). I feel the in-laws had quite an influence on the young W. C. Bradley. 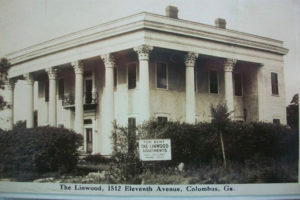 The mansion on land behind Linwood School became an apartment house before it was demolished. I doubt that the Urban Legend about the Nuckolls Mansion has any merit. General Wilson’s forces were only interested in destroying commercially owned property that benefitted the Confederate Army and Government. Not fighting in private homes. Testing out comments so we can discuss photos which will be posted here. Please reply if you want to participate.